So Diablo III was launched at Midnight yesterday after one of the biggest game launches in history rivaling the MMO World of Warcraft. We’re talking two million pre-orders (the most ever for a PC game) and eight thousand launch events worldwide. Over 1000 fans were queuing for the game in Oxford Street alone. So what happened? In short: The launch was an abject failure. The high traffic from so many players logging on all at the same time not only crashed the server but also the gaming forum battle.net as players flocked to it to find out what the hell was happening! The problem was caused because Blizzard – in an effort to combat piracy – required everyone to log into its server, even those who wanted to play a single player game, in order to authenticate. 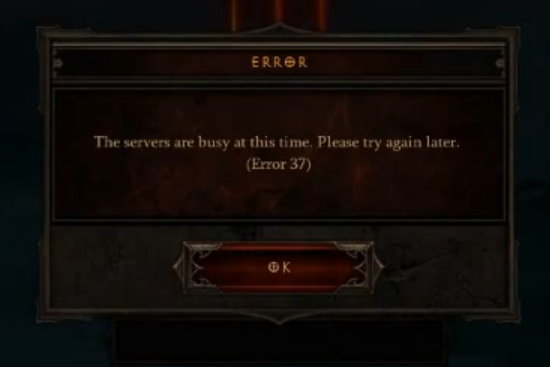 Unfortunately this meant that all most players got when trying to play Diablo 3 was Error Message 37: ‘The servers are busy at this time; please try again later.’ This upset millions of Blizzard fans some of which had taken the day off work for the game’s launch. Surely Blizzard should have been anticipated this kind of traffic and made sure they had the capacity to handle it. But no. This was a total and complete Epic Fail: all that hype over the game only for it NOT TO WORK when it was launched! Boy am I glad I decided I’d play through Diablo 1 & 2 before moving on to Diablo 3. Will they have their problems sorted out by then do you think?